In this section we’ll look a few tips and tricks that will help you stay on top of daily tasks, reduce stress and multi-tasking, and set yourself up for long term success. One thing you’ll learn before to long is that when a potential customer inquires about getting a quote or more information about your company, they expect a quick turnaround time for your response. So much so, that if you don’t get back to them within the hour (sometimes less) they will probably have moved on to another company. Our own experience backs this up too. When we ran a cleaning company we would miss a call because we were with an existing client or in a walk-through with another lead and by the time we returned the missed call that prospect had already booked a meeting with another company and was no longer interested. This is incredibly frustrating and stressful, but also easy to fix. We recommend hiring someone either locally or remotely (ie., a virtual assistant,) to receive all incoming calls, schedule meetings and answer any basic questions callers have. Answering phones isn’t the only thing you can have your VA do. To learn more about this awesome time management hack, check out this blog post. If you go home every day feeling like you had a really busy day, and yet you didn’t accomplish much, it’s probably because you’re spending your days multitasking. Shifting your focus back and forth between HR, marketing, sales — all the tasks in all the departments — and sometimes doing more than one at a time. In addition to being bad for your health (which you can read more about in this blog post,) multi-tasking also has a cost to your business — the switching cost. In other words, the loss of productivity you experience when constantly switching gears, forcing your brain to change its focus and begin thinking about something new. Imagine your day is divided up into 15 minute blocks, and you need to spend 1 hour on any given task in order to complete that task. In other words, the task requires 4 blocks of time. For instance, the photo below shows 15 minutes spent on HR activities. Let’s say on this particular day the HR-related task is going to take you 1 hour. Perhaps it’s writing a job description. So you sit down to work on the job description, but next thing you know your phone rings. It’s a potential client looking for a quote, so you stop what you’re doing to book a walk-through with them. You then try to go back to the job description, but someone from your team knocks on your door with a payroll issue that needs to be resolved by the end of the day, so you switch gears again to focus on that. When you’re done you notice an email that you feel you should reply to right away. Now you’re in your inbox, and we all know what a black hole that is! You’ve been busy all day, but you haven’t actually completed any of your tasks. And not only have you not completed them, but you’ve lost precious minutes each time you switched back and forth as you tried to re-focus on the original task at hand. So how do you make this your reality? The act of intentionally dividing your schedule into sections and assigning each one a different task that you will commit to for the duration of that section. It is easy to put this in your calendar, but the real trick is making sure you only work on the one area of your business so that you can really move it forward. For more tips and tricks on blocking your time, check out this article on our blog, or watch the recording of our live webinar on time management with Swept CEO (and former cleaning company owner) Mike Brown. Are cleaners are on site when they’re supposed to be? Are cleaners clear on the tasks that need to be completed during each shift? Are cleaners running into issues on site that I should know about before my clients? Do cleaners have questions for me during their shift (when I’m at home sleeping)? Many clean company owners, especially those just starting out, believe that they don’t need to have systems in place to manage their cleaners because they are small enough that they can keep an eye on everything just by checking in regularly. Rather experiencing the growing pains of building a team without a system for managing them, we recommend putting processes in place with your first 2 or 3 cleaners so that you’re never faced with training a large team on a new way of doing things, or worse, faced with a client issue that could have been avoided. 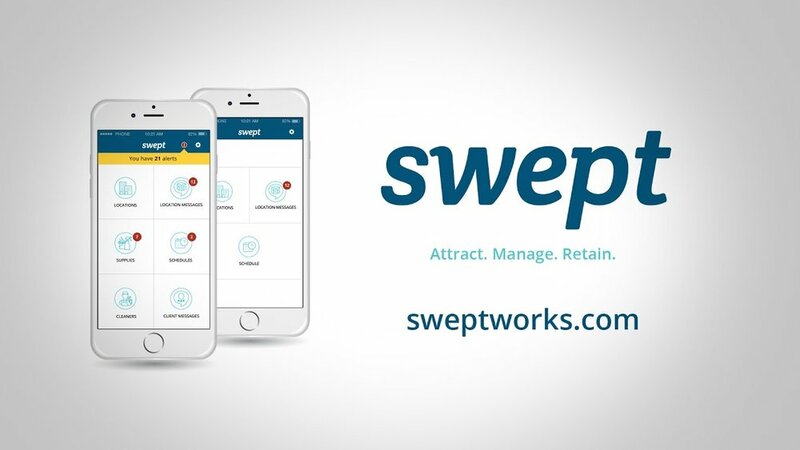 Swept janitorial software is free for companies who clean up to 3 locations. By signing up for Swept early in your business you’ll not only set yourself up for success but you’ll grow more quickly using the tools and resources we provide. We’ve designed our pricing to grow with you — because it starts a $5 a location, you’ll only pay more when you’re making more. To ensure you retain your best cleaners we recommend focusing on employee recognition from the get-go. You can read about best practices for creating employee retention in the Hiring Cleaners section of this guide, but when we were a commercial cleaning company one of the simplest and most effective things we did to retain employees was have our VA (virtual assistant) have spend 1 hour each week calling a few of our cleaners and asking about how things were going, summarizing the call in a written report, and then sharing the cleaners’ feedback with the management team. When we designed Swept software we built a feature that once a week prompts each cleaner to report how they felt about cleaning that week (either happy, neutral or sad,) so that if ever there’s an issue with that cleaner their manager can look back at their mood history and decide how to approach the conversation before reaching out.